I'm currently travelling at 300 km/hr, sitting on a TGV fast French electric train on my way back to the UK after a couple of weeks climbing and exploring in Morocco. We travelled overland to keep our carbon footprint to to minimum*; first via electric car to London then high speed electric trains through France and Spain and finally a ferry across the Strait of Gibraltar to Morocco. 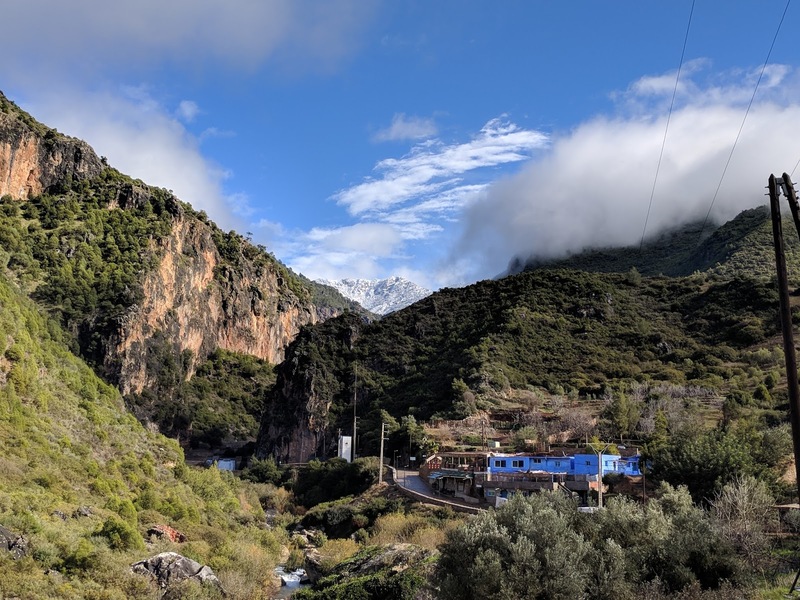 We followed the excellent Seat 61 London > Morocco train booking guide for advice on booking trains and ferries. Seat 61 is an amazing source of information for everything train related. We have their knowledge to book trains as far as Sicily (see blog post) and even China (see blog post)! To maximise available time we left home on Boxing Day. 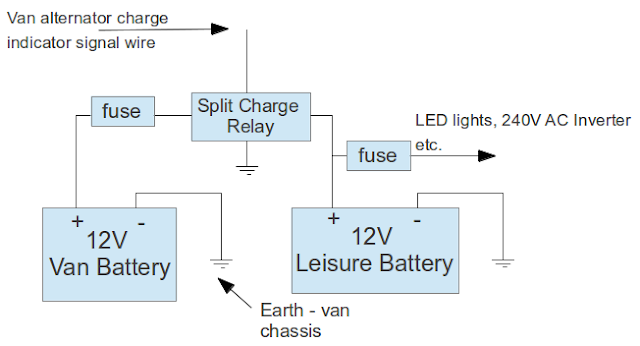 Since there were no trains running we drove to London in our Nissan LEAF electric car. 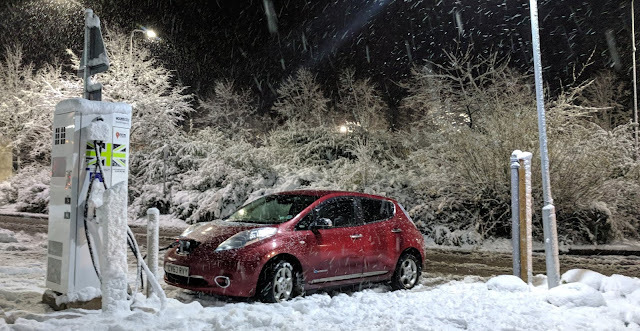 We have done this 280 mile drive many times before; there are so many rapid charging options at motorway service stations the journey is straightforward even in our 2013 24kWh Nissan LEAF (80-90 miles of range in summer and 70-80 miles in winter). However, on Boxing Day the weather was terrible: heavy rain and snow and freezing temperatures, which made the journey slightly more exciting than expected and meant we had to stop to charge a little more often than usual. The next morning we relaxed into the comfy seats of the high speed electric trains from London to Paris and then Barcelona. We arrived in Barcelona in time to head out for some late tapas after checking into an AirBnb. 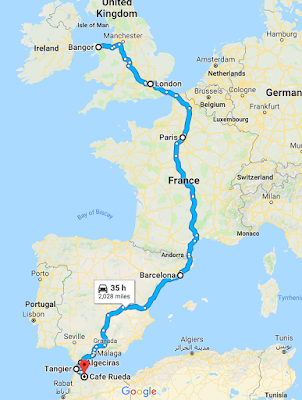 The following morning we got a train from Barcelona to Algeciras with one quick change in Antequera-Santa Ana. Since alcohol is hard to obtain in Morocco, in Algeciras we stocked up on NYE celebration supplies (wine and whisky) before boarding the ferry. The alcohol allowance is a litre of wine and a litre of spirits per person. At this point the journey started to slow down. The ferry was 3 hours late departing, we joked that we were already experiencing Morocco! 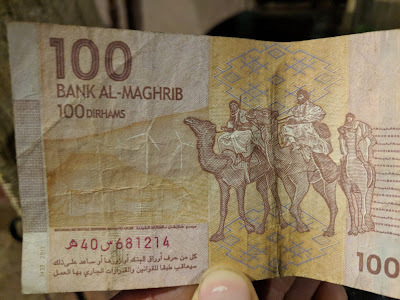 Things seem to happen when they happen in Morocco, following no apparent schedule and generally at a much slower pace! On the ferry we met up with our friends Jon and Emily who were bringing their camper van to Morocco from Southern Spain. 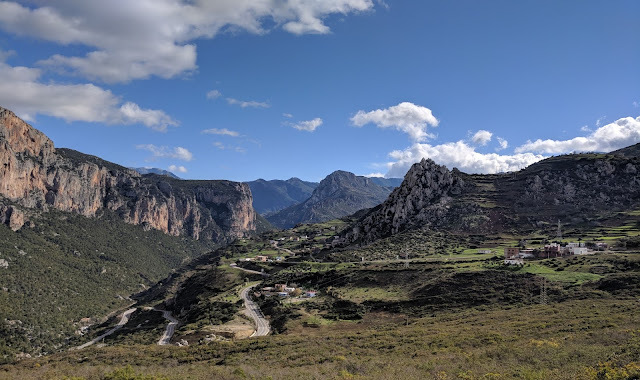 Eventually we arrived in Tanger Med port and, after a lengthy customs clearance process for us and an even longer one for the van, we finally started the 2.5hr drive in the camper van up into the mountains at 1am! The drive was rather exciting, negotiating roadblocks and detours. Eventually at 4am (5am for us on Spanish time!) 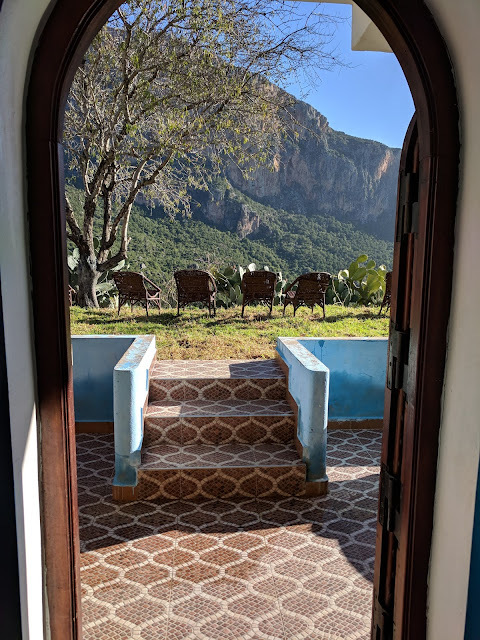 we made it to Cafe Rueda near Talambote/Akchour where we would be staying for the next couple of weeks. 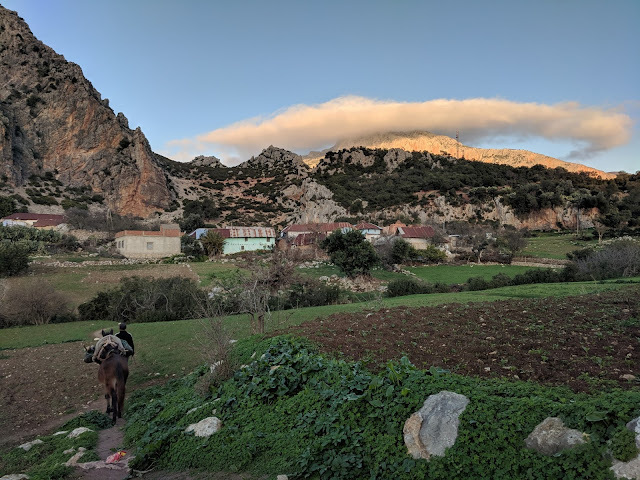 After some much needed sleep we awoke to an amazing sight: a massive wall of limestone bathed in warm, Moroccan winter sunshine. The valley of Talambote is located in Northern Morocco, Talassemtane National Park, in the heart of the Rif and near Chefchaouen. Most of the climbing topos for Talambote/Akchour are now published on Cafe Rueda's website. A guide book was published in 2016 which I bought from here delivered to the UK. 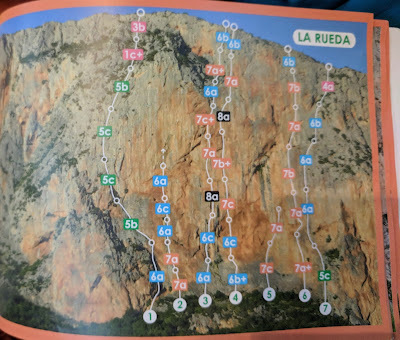 Even though the guide book has most of the latest routes it's worth taking a look at the folder in Cafe Rueda full of hand drawn topos and notes, there are a number of new additions that are not in the guide book. I first heard about the climbing near Talambote/Akchour after reading Jacob Cook's excellant UKC article and Hazel Findlay's blog post. A few years ago I had a really enjoyable and memorable trip big-wall climbing in Tagia in Morocco (see my blog post). 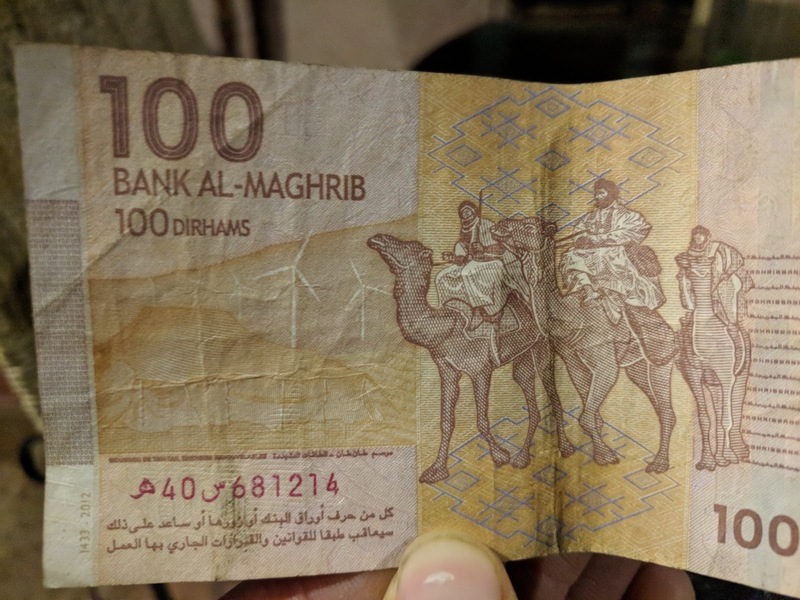 I was keen for another Moroccan adventure. A sunning 400m high limestone wall dominates the vista from Cafe Rueda, however there are also lots of single pitch crag options. The best that we visited being (in no particular order): Ratas, Kosy, Triangel and Pinchos. Most of the climbing in Talambote/Akchour is very well equipped by foreign climbers with well placed bolts and anchors. 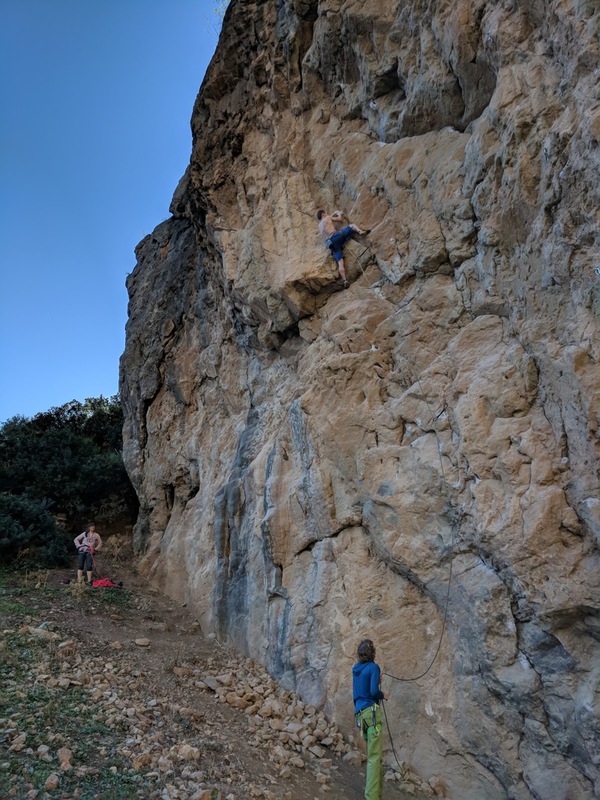 There are a number of multi pitch routes on the main wall which are partially equipped, but we didn't try any as there were enough fully equipped routes to keep us busy during our two week trip. 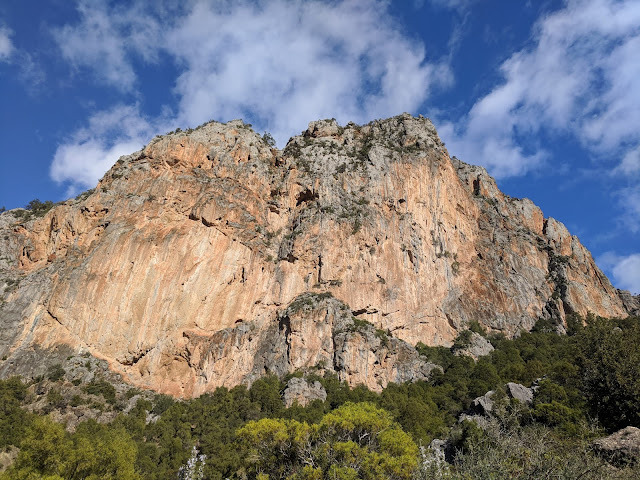 The climbing is varied, the routes on the big wall often have tufa sections, the single pitch crags have a variety of pockets and some sharp edges. Most routes have only recently been equipped and have not had many ascents. Expect some sharp and dirty holds and a bit of loose rock. Sometimes walking and approaching crags can be tough due to the lack of paths and ferocious spiky vegetation! The highest and best looking sector on the wall is La Rueda Wall. The multi pitch climbing highlight of the trip for me was climbing Sahara 7b 245m. 6 pitches of excellent sustained varied climbing (5 consecutive pitches of 7a and above) on La Rueda Wall on lovely solid rock. 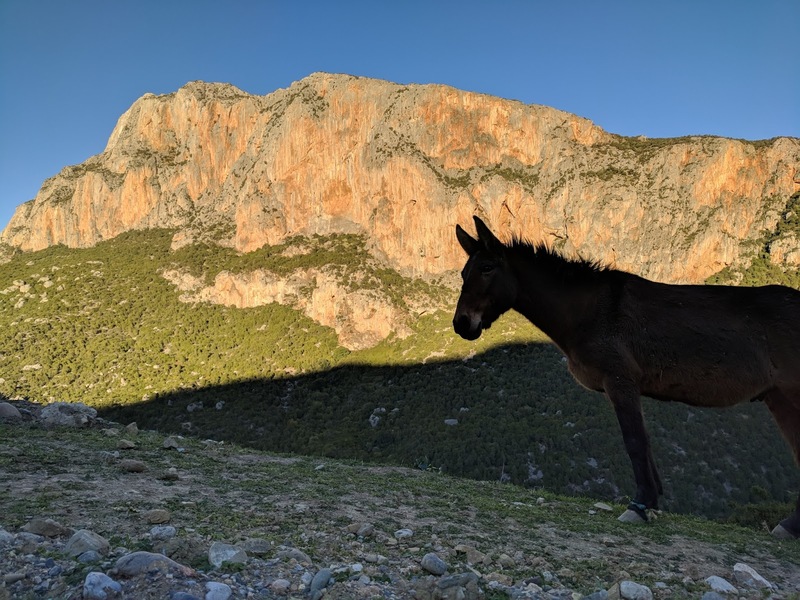 One of the standout highlights of the trip for me was seeing the local wild monkeys up close while climbing Magic Rueda at Eperon Kert on the left hand side of the big wall. The monkeys seem to be concentrated in the rambling sectors between Africa and Eperon Kert. Seeing so many monkeys in the wild so close was an unforgettable experience, it was like being inside a monkey enclosure in a zoo! We even saw a mother monkey carrying a baby monkey on her back while climbing up the wall! 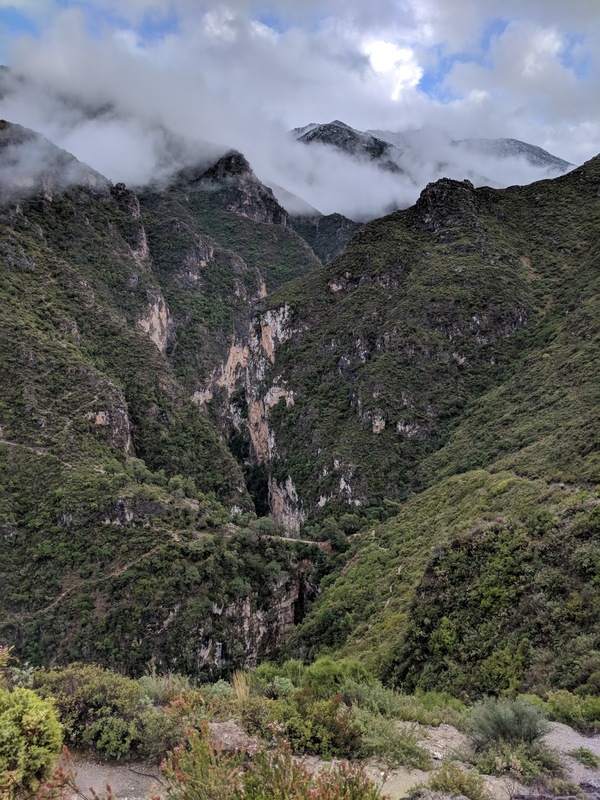 The scenery around Talambote/Akchour in Talassemtane National Park was stunning. On rest days we went for a number of walks around the area. We visited Talambote over new year (late December / early January). When the sun was shining the temperature was great for climbing. It was even a bit too hot to climb in the sun for the first few days! We experienced a few days of rain during our visit and a number of overcast and windy days. The temperature on overcast days and at night was actually quite cold. There was even some snow on the higher hills around us! The cold temperatures made living and climbing quite uncomfortable at times. Cafe Rueda has no form of heating, the building is obviously designed more for keeping cool in the summer rather than warm in winter! I would recommend taking sleeping bags to supplement the blankets provided! Snow on the hills above Akchour! Possibly a better time to visit to have a higher chance of good weather would be Spring/Autumn, but be prepared to have early starts when climbing on the big wall since the sun hits it about 12pm and then it's in the full sun all day. Travelling in Morocco is quite an experience, leaving Europe is very noticeable,just about everything is different! We found everyone we met to be very friendly and welcoming, even though more often than not people are very poor. 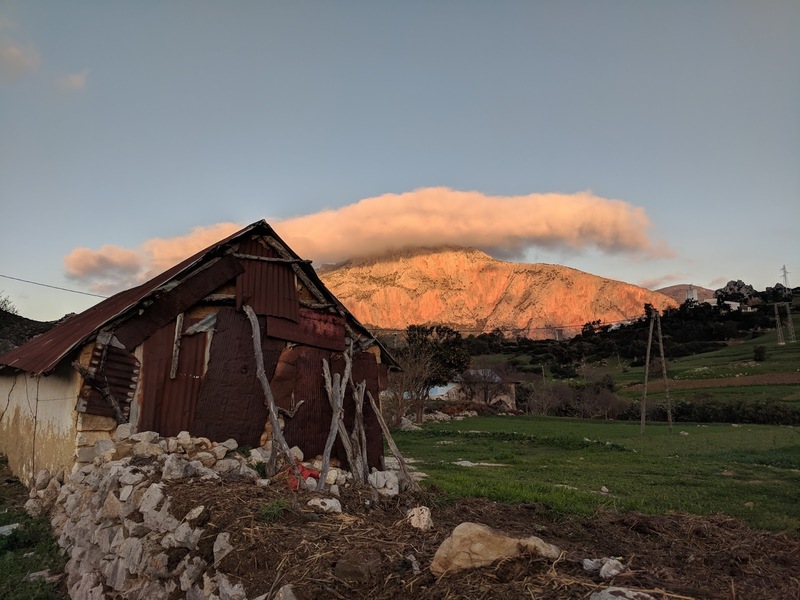 I wrote extensively about the experience of travelling in Morocco in the first part of my Taghia blog post: Morocco Taghia - Part 1: Travel, People and Landscape. Spending time in Morocco certainly makes you appreciate so many things we take for granted in our everyday lives. Traditional very very sweet mint tea, responsible for mot adults not having many teeth left!